The members of the Tunisian National Dialogue Quartet awarded the Nobel Peace Prize in Oslo Photo: EPA/HO. Daily Telegraph. Beating off hotly tipped favourites such as Pope Francis and Angela Merkel, the 2015 Nobel Peace Prize was won by the Tunisian National Dialogue Quartet. ‘The Tunisian what…?’ asked everyone in surprise. Is it a string quartet? A debating society? Well, actually, it’s a rather unusual coming together of four major Tunisian organisations. Two of whom are historical enemies: the trade union UGTT and the confederation of business, UTICA. The other two members of the Quartet, perhaps neither enemies nor particularly friends, are the Tunisian bar association, ONAT, and the human rights group LTDH, the oldest in the Arab world. These four unlikely partners came together against a backdrop of political assassinations, violence and social unrest, which was threatening the democratisation process initiated by the Jasmine revolution. Tunisia was at a flashpoint, on the brink of civil war. How do you stop a country tearing itself apart? Inflicting wounds and horrors that would hurt for generations to come? Destroying homes and cities, setting brother against brother, sister against sister? Do you stage a coup? Imprison the prime minister, sack the government and send troops into the streets? No. Not if you’re the Tunisian National Dialogue Quartet. The clue is of course in the title. They talked. And talked, and talked, and talked. And then talked some more. 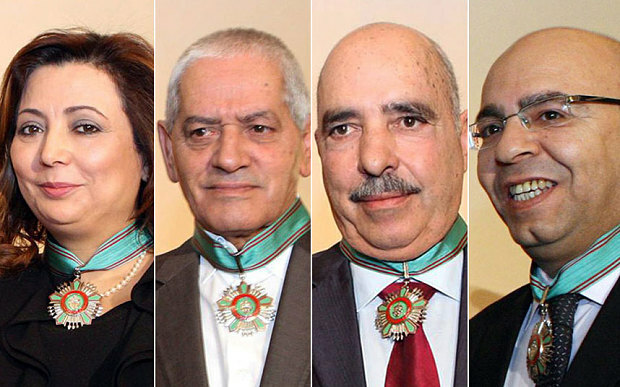 One of their greatest strengths, as the Nobel citation noted, was that the four organisations represented ‘different sectors and values in Tunisian society: working life and welfare, principles of the rule of law and human rights. On this basis, the Quartet exercised its role as a mediator and driving force to advance peaceful democratic development in Tunisia with great moral authority.’ The Quartet acknowledged but accommodated differences and acted in unity; together they managed to reach deep into the varied sections of Tunisian society, where they argued for and promoted reconciliation, democracy, and the idea that a peaceful pluralistic society was indeed possible. Not only did they argue for it, they achieved major constitutional successes to establish it. In October 2014, in a convention centre colourfully decorated with flags and white flowers, the representatives of two dozen, that’s twenty-four separate Tunisian political parties, assembled, having agreed to sign a document known as the Road Map. A document that would define Tunisia’s future and perhaps that of the Arab world. ‘Thank you for heeding the nation’s call,’ welcomed Houcine Abbassi, representing the Quartet. Television cameras were present to record the moment, and to ensure the signatories would abide by the terms and conditions of the Road Map. The leader of the ruling party, Rached Ghannouchi, faced with such a public and binding commitment became reluctant to sign. For the next three hours, in a separate space and off-camera, Houcine Abbassi reasoned, argued, debated and tussled with Ghannouchi. While journalists, witnesses and political representatives waited confused and impatient in the hall. Eventually, Ghannouchi agreed to sign. The Quartet and dialogue had won out. The Norwegian Nobel Peace Prize Committee often likes to use the prize to send a signal, a message to others that the Nobel laureates of that year, have come up with a really useful idea. The citation makes it very clear the prize is awarded to the Quartet and not to the individual organisations; recognising that it was the entity they created by coming together which enabled their success. The Quartet managed to achieve, in the space of a few years, what some other countries have failed to achieve in hundreds of years. Many other factors contributed: such as the willingness of the ruling Islamist party to compromise, the mature decision of the other political parties to refrain from the dog-fighting of ‘politics as normal,’ and the rejection of foreign interference and meddling. Peace congresses are dialogue, and dialogue is democracy. Dialogue may sound easy but is tremendously hard work: physically and intellectually demanding, requiring endurance, persistence and perseverance. Like marathon runners or mountain climbers, participants have to dig deep, call upon their reserves of strength and patience, reasoning and logic, empathy and hope. They have to have respect for themselves and maintain respect for the other party; ensuring their own behaviour is principled and courteous, and acknowledges the rights and dignity of the other side. If respect is not valued by both or one of the parties, the dialogue comes to be governed by hostility rather than reason and goodwill. If one party endeavours to manipulate, dominate or bull-doze the other party into acquiescence the resulting agreement will be flawed and lack integrity, unlikely to stand the test of time. In dialogue language has to be used with the precision of a scientist and the imagination of an artist. Its stringent truth and logic adhered to, but ideas allowed to grow and develop so that solutions can be evolved. The Tunisian National Dialogue Quartet sends this message to the world: Dialogue not violence. Words not war.